Will Luxury Shoppers Buy Electric Cars at Nordstrom? Store-within-a-store concepts built around vendor-retailer partnerships have grown popular recently, appearing everywhere from big name apparel retailers to big box electronics stores. Nordstrom is no stranger to store-within-a-store concepts, but their latest partnership turns off the beaten path. 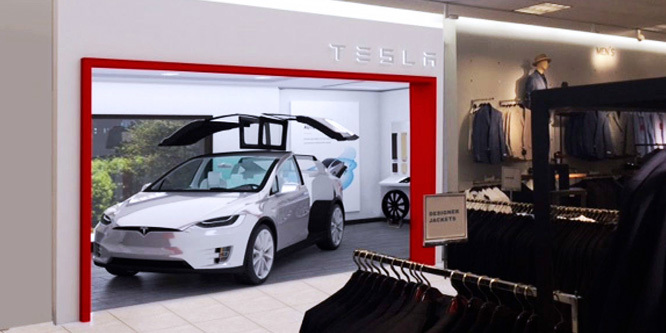 Nordstrom has partnered with Tesla, manufacturer of electric cars, and has opened a Tesla boutique store in a Los Angeles Nordstrom location, according to USA Today. The store-within-a-store is in the men’s department and is slated to remain for the rest of the year. Nordstrom’s other experiments with in-store pop-ups have seemed more conducive to the store’s settings. The retailer’s “Pop-In@Nordstrom” initiative has introduced a revolving lineup of stores-within-stores featuring designer fashions, skin care brands and other items geared towards a luxury shopper.